There are not as many truly ethical and sustainable brands as there are who present themselves to be. Many companies tend to greenwash their products to give them a “greener” look for a better public image, but a lot of what they do to create or what is in the product are from what there claims are to be. Sustainable Jungle provides an eco-brand checklist for viewers to see for themselves how sustainable the brands they know are. Ideally a true sustainable brand should check off on every section, but it is not always easy for a brand to do so. Sustainable Jungle claims it is more like a spectrum, and every brand falls somewhere on that line. The farther the brand is on the sustainable side of the spectrum, the better! There are a number of reasons why we should care to buy sustainable products, especially beauty and skin care. Do you really want to be rubbing things like BHA and BHT, aluminum, coal tar dyes, and other such ingredients into your skin? Studies have proven that these ingredients can possibly cause cancer or other harmful effects in the long run. Another reason to invest in natural beauty products is for the sake of the environment. Palm oil, a commonly used ingredient in skin and beauty products, is a huge threat to our delicate environment, for it has caused thousands of hectares of rain forest to be destroyed in order to harvest it. Leaves of Trees is a prime example of a Canadian brand that produces sustainable and ethical products that work. All of their skin care products are made with organic and fair-trade ingredients. All of Leaves of Tree’s products are also made in-house by hand in small batches to prevent over-production and ensure maximum quality. Their products are also certified by PETA’s Beauty Without Bunnies Program to be 100% cruelty free! None of their products nor ingredients have been tested on animals. Aside from goat milk, honey, beeswax, and Tussah silk fibres, the majority of their products are vegan. They also make sure that their packaging for their products are recyclable. One particular product that we would like to focus on is their most successful: Leaves of Tree’s all-natural deodorant. Most people believe that naturally-made products come at a cost, they sacrifice quality for effectiveness. This is not the case however with this company’s aluminum free and organic deodorant for both men and women. The formula is a special one that combines antibacterial ingredients with moisture-absorbing ones. It’s all in the name. 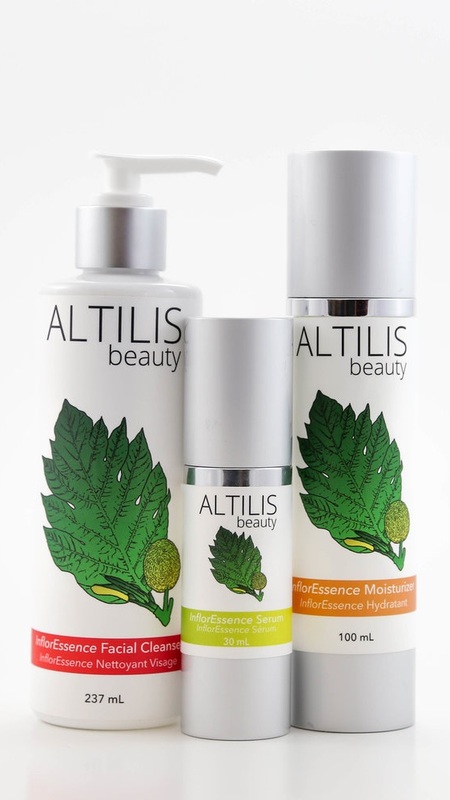 Altilis stems from the name of artocarpus altilis, more commonly known as breadfruit. Breadfruit is what this brand is all about. It is their main ingredient to all of their skincare products. Their founder, Kenna Whitnell, discovered the powerful skin-revitalizing properties of breadfruit while studying at the University of British Columbia back in 2017. She discovered that the plant’s phytochemicals of terpenes and flavonoids offer UV protection and cancer prevention properties. She also found that the breadfruit’s fatty acids have anti-inflammatory properties that can be used to reduce acne and rosacea. Breadfruit comes from the islands of Samoa, and Altilis partners with farmers there to grow and harvest breadfruit trees. By working with them, Altilis provides new income opportunities and encourages the replanting and caring of these trees to conserve this valuable resource for not only their own business use, but for the traditional uses of the local Samoan communities. Altilis is proud to be supporting the farmers who make their raw materials, and is proud to create a product that is healthy and organic in every way for your skin. Many would be happy to know that they are also cruelty free! Their InflorEssence skincare line is the effectiveness you need, particularly their facial cleanser. When you go to wash your face, use this first! Its key ingredients include breadfruit which offers antioxidants and soothing properties, Honeybush which improves skin texture, aloe vera which reduces the look of wrinkles and redness, lactic acid which promotes healthy cell turnover, and trans-resveratrol which brightens the skin and reduces skin irritations like acne. These ingredients do just as stated and more! Your skin will look and feel younger and fresher. Lastly, we are finishing with a company that is sold at one of our crew member’s stores, Lemonberry! Da Lish is all for local. The company began when Toronto woman Melanie Cruickshank started experimenting with making cosmetics in her own kitchen from pure natural ingredients. She studied chemistry and learned not only how to make skin care and beauty products, but also the effects they have on your body. Da Lish started back in 2006 before the trend of natural and sustainable cosmetics. They led the way, but business was slow at first because not many people at the time had realized just how overly-processed and damaging the usual brands are. Cruickshank notes that people are getting illnesses and diseases that are not hereditary. It is because of the unnatural products we use and consume. Da Lish specializes in making products that are anti-oxidant rich, and they use a variety of natural ingredients including shea butter, fatty acids, and vitamin rich sunflower oil. They are also 100% cruelty free. Nearly all of their product ingredients are sourced locally right here in Canada. Their products are loved by celebrities all over. A product of theirs that is certainly a must-try, are their matte lipsticks. They are 85% natural; not 100% because they are stabilized to resist mould and bacterial infections. They come in bright colours, they are long lasting, and they certainly will not dry out any lips! Be sure to visit these wonderful brands’ Instagrams and websites!